Founded in 2002, Lynxspring embraces open software and hardware platforms and develops, manufactures and distributes edge-to-enterprise solutions and IoT technology for today’s intelligent buildings, energy management systems, equipment control and specialty machine-to-machine applications. Lynxspring’s technologies simplify connectivity, integration, interoperability and data accuracy and exchange from the edge to the enterprise. Lynxspring is a company where ideas and imagination empower people to create, manufacture, deliver and support innovative solutions - connecting people and devices in a responsible way which improves quality of life. Lynxspring delivers IoT solutions developed by empowered individuals dedicated to sustainability of our shared environment. Lynxspring plays a significant leadership role in organizations influencing the markets and industries we serve. Lynxspring is a founding member and serves on the Board of Directors of the Project Haystack organization, an open-source, community-driven initiative focused on streamlining working with data from the Internet of Things and developing semantic modeling conventions and taxonomies for smart devices and equipment systems. The amount of data created by equipment, systems and devices connected to a building automation system or energy management system has exploded. Today's automation systems and smart devices produce tremendous amounts of connected data; however, this data can be very hard to organize and use across different applications because it is stored in many different formats, has inconsistent naming conventions and very limited data descriptors. It lacks information to describe the meaning of the data and without meaning a time-consuming manual effort is required before analysis and value creation can begin. Without proper analytics, this data is not useful. Lynxspring’s involvement and initiatives in Project-Haystack are helping to do that. The community has developed a flexible, extensible, data modeling approach and standard models for describing the data modeling techniques, significant libraries of equipment models, and software reference implementations to easily enable software applications to consume smart device data that is marked up with Project Haystack data descriptions. Learn more about our involvement with Project Haystack. The Continental Automated Buildings Association (CABA) is a leading international, not-for-profit, industry organization that promotes advanced technologies in homes and buildings. The 340-plus strong CABA members and 5,000 individual industry contacts are leaders in advancing integrated home systems and building automation worldwide. Over the years, Lynxspring has been honored to have been recognized with a variety of industry accolades and awards that are a testimony to our standing as an industry leader. This is the result of our never-ending quest for excellence in technology development, product design and our commitment of always putting our customers and partners first. Companies of all types are linking devices, sensors and systems to the Internet to become part of the Internet of Things. While this connectivity brings convenience and opens a world of opportunities, it also creates unprecedented security challenges. The best way to approach cyber threats is to realize one simple truth: It is not if an attack will happen; it is only when. It is all of our responsibility to take an active role to prevent cyber issues from occurring. Cyber security is our utmost concern. 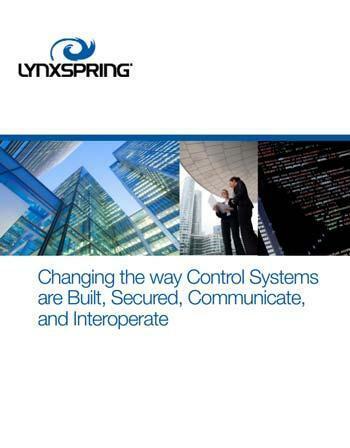 Lynxspring is committed to taking a strong leadership role in helping our customers maintain a strong security posture by arming them with industry security information needed to be better prepared for possible cyber intrusions and providing the procedures, best practices, services and higher levels of security tools that help ensure the cyber protection of their systems, devices, applications and data.